There's a new tab on the Merit Badge Counselors page to view the counselors who belong to your troop. You can now add multiple badges to a a counselor in one shot, and the system no longer allows you to add the same badge for a counselor more than once. A new report shows you the merit badges for which you do not have any counselors. We added a number of STEM focused Girl Scout awards at every age level. Update All Shirt Sizes pages make it easy to enter everyone's shirt size. The Order of the Arrow Eligibility Reports can be run for a future date. It's easier to find an event now that the Maintain Events page has been split into two tabs, one for upcoming events and the other for those in the past. You may now deactivate troop accounts when you close the corresponding bank account. You can manage the Our Adult Leaders page by excluding selected leadership positions. Troops that absorb the PayPal fee on member payments can now designate a budget item for this expense. The FROM name on an e-mail will no long include the city portion of the troop name. Scouts can view fundraiser sales orders after the order entry end date. Files that are uploaded to the site retain their original file name. 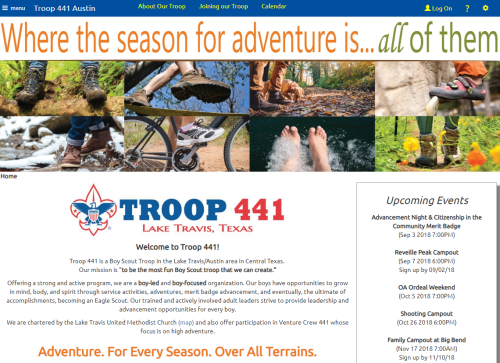 Troop 441 of Lake Travis, Texas! The professional graphics and layout of the Home page make this site really stand out, but as you explore further you find so much more! The Troop Leadership page is unique, with a link to the Our Adult Leaders page, which features photos of most of the leaders. We encourage this practice as a way to make it easy for new scouts to learn who's who in their troop. The Joining Our Troop provides concise, step-by-step instructions for joining Troop 441. And we love the graphics on the Home page which link you to other public pages on the site.